Is your SERP working for you? 2014 Edition. Sometimes the simple things matter. SEO has evolved into a sophisticated battle with Google and Online Competitors but its refreshing to see that some things remain the same. A client was concerned about what appeared in their SERP (Search Engine Result Page result) and rightly so! In their case, it displayed misleading information that was more likely to confuse rather than lure prospective clients to click and visit their website. Google had retrieved details from the page it selected for the search result, and did its best to assemble what it thought was a relevant description of that page as it related to the search. The end result was a misleading jumble of disconnected phrases and certainty not a relevant sales pitch, for example like ours illustrated above. A SERP is your prospect’s first contact with your business when searching; it is effectively your online classified ad in Google. 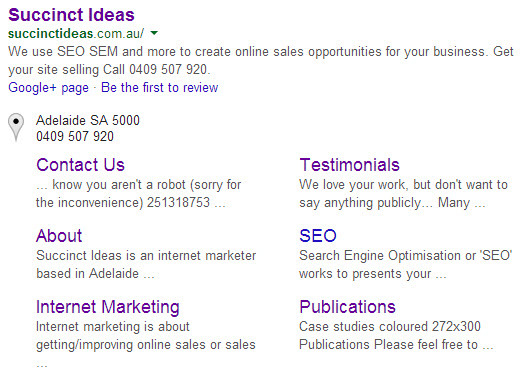 Quoting from my 2007 newsletter Is your SERP working for You? The SERP is one of the most critical pieces of copy in online sales. You can influence Google to display a nicely composed SERP by astute use of the Title and Description metatags, however if Google decides it may use other information on the page to compose its SERP. Here’s something more about SERPs – If you use 5 or more elements in your search Google will display an extended SERP – it has a higher character count for both lines. The big Daddy of SERPs is displayed when Google decides that the search is closely related to your site. Google provides previews of your site’s important pages and throws in other info like your Google+ page. Google shows a popout infographic on the right hand side. Notably Google doesn’t let you nominate what pages it selects to display, but it is possible to remove pages from your Site link display using WebMasters Tools. http://succinctideas.com.au/wp2/wp-content/uploads/2014/08/si-colour-logo-300x137.png 0 0 pete http://succinctideas.com.au/wp2/wp-content/uploads/2014/08/si-colour-logo-300x137.png pete2014-03-26 23:43:182018-05-03 07:55:44Is your SERP working for you? 2014 Edition.